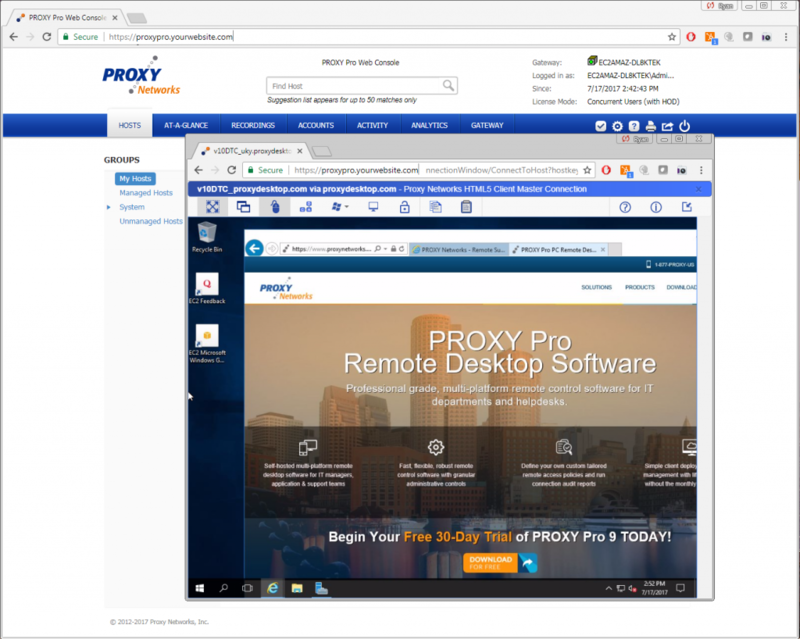 Today, Proxy Networks announces the availability of the BETA of PROXY Pro v10 to a limited number of customers. In this BETA, we are not providing PROXY Pro Masters or Hosts just yet, instead we are providing the server-side components being the Gateway Server, Web Console and the new PIM (Proxy Identity Manager). Existing v9 Hosts can be pointed to the v10 Gateway and you can use either the browser-based ClickOnce Master connection window or the newly available HTML5-based Master connection window (shown). The expectation is that this single server is for testing only and will need to be uninstalled and discarded when we deliver our official version in the coming weeks, as we’d like to limit the amount of pre-release builds we give out. Please reach out to support@proxynetworks.com if you are interested! Thank you! Version 10.0.0 marks the beginning of the 3rd generation of PROXY Pro technology. This new generation allow development to use the latest tools and technologies available, leading to even more robust and secure code. The new architecture helps to lay the foundation for many enhancements down the road including things like scale up and scale out as well as multi-factor authentication, native x64 versions etc. Until now, authentication had been limited to Windows Authentication. Version 10 allows us to break from that in order to use alternate identity providers and provide multi-factor authentication. The initial release will include support for talking directly to the Microsoft Azure Active Directory (AAD) tenant service. The Gateway now supports hierarchical groups. These groups will possess security inheritance, and Active Directory synchronization via Host Grouping rules (i.e. organizing Hosts workstations according to their location in AD). Active Directory Synchronization This feature allows for Hosts to be organized in the same way that they are organized in Active Directory. This is driven by enhancements to the Host Grouping rules feature and the addition of hierarchical groups. Highly improved installation experience for Web Console and Gateway Server. This will facilitate the services running on multiple boxes, setting up of SQL Express if needed, and automatic handling of prerequisites. As an alternative to the ClickOnce or installed connection windows, version 10 introduces the ability to use an HTML5 browser with no plugin. The Web Console will offer HTML5 as an option when ClickOnce is available, and use it by default when there is no native helper application available. All data is now kept and managed by Microsoft SQL Server. Use of the “Jet” database engine (MDB files) has been retired. The Gateway companion service will no longer be necessary as Web Console and Gateway Server now communicate directly with each other. This includes full administrative functionality, so that the MMC-based Gateway Administrator is no longer required to perform certain administrative tasks. Ability to generate PROXY System Information reports (prxsinfo) remotely. An administrator can now remotely request their respective servers, Host and Gateway, to initiate PrxSyInfo reports, and the results of those reports will be transmitted to the client for viewing and storage. Deployment of the Gateway into a DMZ is now fully supported since we no longer require Windows Authentication and also allow off-box SQL. This will not be in the 10.0.0 release but the foundation for it has been laid.